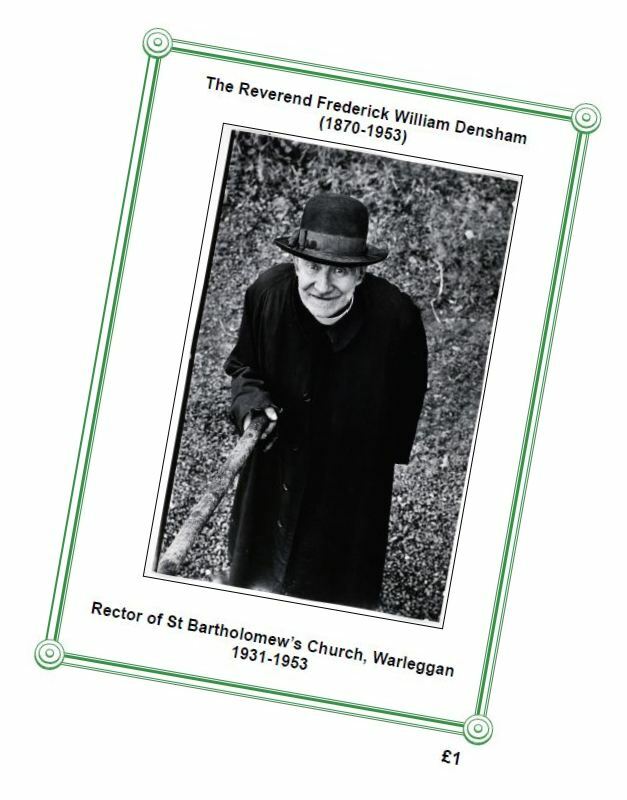 The Reverend Frederick William Densham was Rector of St. Bartholomew Church from 1931 until his death in 1953. 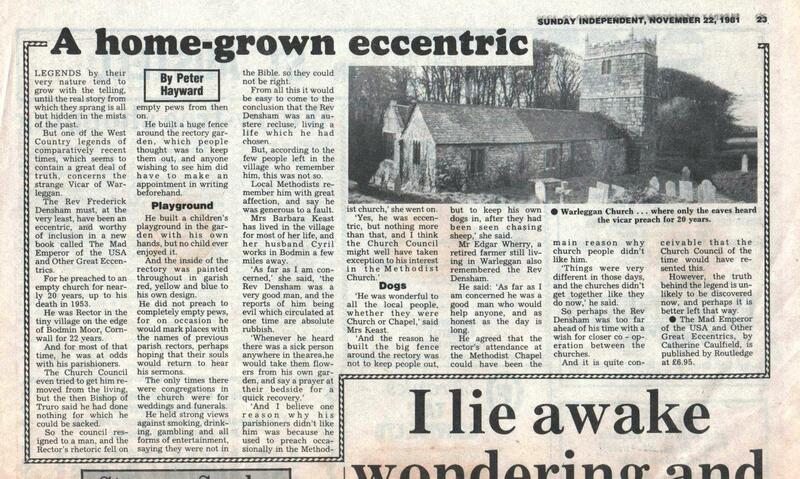 He was an interesting character – indeed, something of an eccentric. On the one hand, he alienated himself from many through his determination to rid the parish of whist drives, his refusal to conduct Sunday School, and his dislike of organ music. He erected a barbed wire fence around his house to prevent his dogs worrying farmers’ sheep, but this barricade did little to make visitors feel welcome. He once painted the church in a medieval riot of colour, much to the annoyance of parishioners, and he was subsequently required to return the church to its original colour; and there was many a time that he preached to an empty church – indeed, he was meticulous recording the attendance (or lack of it) in the register, on one occasion writing “No fog, no wind, no rain, no congregation”. On the other hand, he is fondly remembered by many parishioners as a kind and generous man who would bring rhododendron and camellias in spring to villagers and would send milk to people who were ill. He built a playground for children, and held slide shows – there are still some in the parish today who remember going to these slide shows when they were young. And he was friendly with the Methodists in the community. Densham was, first and foremost, a Man of God. In many ways, he was ahead of his times. He would often be seen preaching at the Methodist chapel, this at a time when there was little tolerance between church and chapel, especially in a conservative community such as Warleggan back in those days. His father had been a Methodist preacher, and it is not known why he had become ordained into the Church of England. Before coming to Warleggan, he had spent time in South Africa and it is believed he may have visited India. He revered Gandhi, and ‘ahimsa’ – compassion – together with strict religious Christian precepts, were key elements of his thought. Much has been said about him – a mixture of truth and fiction, of memory and imagination – and different people have different memories of the man. But few who met him will fail to remember him. A Congregation of Ghosts (2009)*, a film starring Edward Woodward as Densham, directed by Mark Collicott. A detailed 16-page booklet about Rev Densham, researched from contemporary publications and drawing upon eye-witness interview accounts, is on sale at St Batholomew’s Church in Warleggan – cost £1 – in aid of church funds (see illustration, above right) – or let us know and we can post a copy to you. Densham’s Delight – the Ancient Tree Forum have (in April 2013) verified the presence of a number of ‘veteran trees’ at the Rookery (the old Rectory), including the Densham’s Delight apple*, which, according to information posted has its own wassailing song*. Other trees identified include another apple tree (the ‘Warleggan Whopper’*), and a wild cherry – note that the Ancient Tree Forum is always interested in volunteer tree mappers to join their outings all over Cornwall (read what they say*) and also possibly to identify ancient trees in the parish. Although a couple of years late, but I have just seen your post about the Warleggan variety fruit trees. We are not local to Warleggan, but have been coming to visit for many years. We are coming down next week (31/3/18) to stay for a week in Warleggan and being a keen gardener I wondered if you still have any of your grafted trees available? If so please let me know how to contact you while we are in the village to pick one up. I am about to get Reverend Densham’s two cooking apple trees budded. They are veteran trees and unique varieties according to an apple expert. Are you interested in having your own Densham’s Delight or Warleggan? If so please let me know as I want to take some branches in for budding within the next week. They will cost ten pounds each (this is the Duchy Nursery Lostwithiel cost price). I am going to ask them to put mine onto dwarf stock, which still makes a fair sized tree apparently of about 10 feet tall, but I can confirm this. The price is the same regardless of the stock and they will be ready to collect in November next year. Main thing is – please tell me by July 31st at the latest! I am asking around the parish because if they really are genetically unique then I would like them to be housed in several gardens. Monday and Thursday mornings: Age Concern Bus from your house to where you want in Bodmin, £5 return – call driver Clive on 07412 854 000 to see if he can take you – also sometimes they go Wadebridge etc.